Katherine Parris is an event planner extraordinaire with over 20 years of experience. Her weddings are legendary whether you are planning an intimate event for 2 or a major extravaganza for a few thousand of your closest friends. She created the Toronto Wedding Chapel, an intimate and elegant wedding chapel in the heart of mid-town Toronto, specifically to cater to smaller groups. Beautifully and elegantly pre-decorated with florals and candles, Katherine Parris has spared no expense in creating a symphony in white. Having more than 25 guests at your weddings? Your wedding day will be one of the most memorable days of your life. Let us help you to create the wedding you’ve always envisioned. Dream it-and we will make it happen. With our experience, our ability to exceptional organization, our expert professionals, and our personal touch, we make sure that your special day is effortlessly carried out, on time, on budget and carefree. The Toronto Wedding Chapel offers a comprehensive list of options to enhance your wedding experience. You may choose one or more options to add to your wedding package, or create an entirely unique wedding package from these options. We encourage to browse at your leisure and contact us once you’ve made your decision to discuss the option(s) in detail. Our small wedding packages in Toronto are for up to 25 guests. A popular choice is having brunch, lunch and dinner weddings. For information on off-site weddings please inquire. Contact us today! “I don’t know where to start when it comes to working with Katherine. The entire process was stress free because Katherine took care of everything. She pays great attention to detail and my wedding was more than I could have imagined. On Sunday August 28th Katherine and her team created the most beautiful atmosphere that anyone could have asked for for their wedding. My guess was in love with the place. Katherine had Every T crossed and every I dotted when it came to my day. Her staff was very professional and I had a blast. I did not want my day to end. If I was to have my day over again I would put my day in Katherine’s hands anytime. ‘Since the day I got engaged I tried to envision what my wedding would look like. While I knew it would be beautiful, I never could have imagined it to be as breathtaking as it was. My husband and I always knew we wanted a small, intimate wedding so we decided to check out the Toronto Wedding Chapel. From the moment I laid eyes on the room and saw the potential for my dream to become a reality I was sold. Of course Katherine was the cherry on the cake.. She has a knack for making you feel taken care of and always followed through. She took care of things I hadn’t even thought of, and the communication was thorough. My wedding day not only was a success, but my guests all left happy. The food was to die for, cake was amazing, flowers were beyond anything I could have expected, and the service was impeccable. They made sure everyone was catered for, including my hyper 4 year old son and niece. Choosing the right venue is key to the success of any event. There seems to be a plethora of large, cavernous spaces for groups of several hundred. However, for those in search of a warm and intimate space for corporate or personal events, there has been very little option – until now. The Toronto Wedding Chapel Event Space is a unique and stylish venue for your important events. We can comfortably accommodate up to 25 guests. Just steps from Yonge Street and centrally located in the heart of Toronto, the Toronto Wedding Chapel Event Space is a sophisticated, midtown venue. Beautifully appointed and elegantly understated, this is the perfect venue for any type of corporate or personal event requiring a lovely, decorated space for intimate gatherings. Owned and operated by Katherine Parris, a professional event planner with many years of experience, we can handle the entire event for you or provide assistance on an as needed basis. Our comprehensive range of services includes invitations, flowers, catering, bar, photography, audio/visual, transportation, entertainment, and décor. The Toronto Wedding Chapel Event Space can easily be transformed to suit your needs. 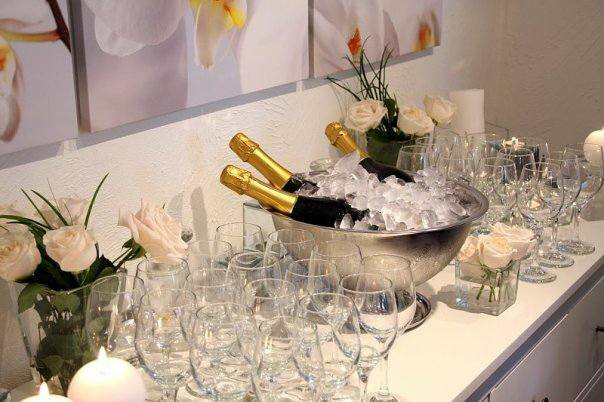 We offer flawless service and attention to detail at a fraction of the cost of traditional meeting venues. The Toronto Wedding Chapel Event Space is a great venue in a great location at great prices. There is plenty of parking in the area in addition to being TTC accessible. Contact us today to discuss hosting your next corporate or personal event at the Toronto Wedding Chapel Event Space. Contact us today for booking rates! Corporate entertaining is an integral part of branding and should be included in your overall marketing strategy. The size of the event does not minimize or maximize its importance, particularly in light of the fact that the marketplace is becoming more competitive – for clients, for employees, for market share – every day. The Toronto Wedding Chapel Event Space is an ideal venue for corporate events with groups of up to 25 guests. Contemporary, stylish, and easily adaptable to your corporate needs, we are an excellent and very cost effective option for smaller events. Thanks to Katherine Parris and Toronto Wedding Chapel for their continued support to A Celebration of Women™ Foundation Inc.